No-one can say they don’t know how to make period dramas in England. They are wonderful at it and they do it a LOT! I feel at least 80% of the British shows I’ve seen over the years have been period dramas. I’d have to conclude almost all of them are “good”, but they rarely feel “ground-breaking”. There are millions of period dramas to choose from in UK TV, so it is hard to decide which one to watch next. Lately, I am becoming more and more attached to Channel 4 programs, especially since I discovered my new obsession Utopia; which is the main reason I decided to give The Mill a chance [it was also nominated for a BAFTA]. The Mill tells the story of the workers of Quarry Bank Mill in Chesire, England. It serves as a historical drama, dealing with the changes in labour laws throughout the industrial revolution; but it is also a character driven show. In fact, I think the strongest aspects of the show are not the historical components but the relationships and personal drama. There are many things about this show that felt refreshing. It’s not about an epic romance or a major event; it’s about common working-class people. Don’t get me wrong; I love Downton Abbey, as much as the next TV fan, but sometimes it feels like we spend too much time on the rich. 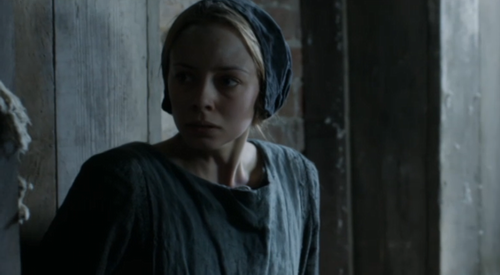 The first episode has Esther facing the threat of being raped by one of the mill’s overlookers. Esther does what no-one seems to do in historical dramas and she starts accusing the man left and right. When no-one pays attention to her claims, she takes matters into her own hands, steals a bell’s clapper and hits the man in the head when he was about to take advantage of her. And the story continues like this. The writers didn’t fall into the trap of making Esther a “pristine” character either. They kept her personality consistent with her social standing (For instance, she has a child out of wedlock). The rest of the characters aren’t as colourful or original, but they are still compelling. In summary, after watching my share of period dramas, I think they managed to give the genre some edge with The Mill. Should you watch it? Not “must watch” TV [unlike Utopia] but quite enjoyable, especially if you love period pieces.